On June 20th, Dior inaugurated its latest boutique, right in the heart of Seoul’s Cheongdam-dong district. The six-story building, designed by architect Christian de Portzamparc, brings the Dior codes to life with an innovative interpretation. Christian de Portzamparc began his research for the new project back in 2011 by delving deep into the Christian Dior archives. Inspired by the architectural precision with which Monsieur Dior constructed his gowns, he integrated this into his own vision for a building formed of eleven white sails falling in soft, fluid folds, like the plain “toiles” from which the couturier sculpted his designs. Transforming the vision into reality was a feat of modeling and construction, culminating in the official opening on June 20th after a vastly ambitious and meticulous building program. The new boutique – or House of Dior – presents the Dior universe over six floors in a décor of wood, lacquer, leather and weaves created by interior designer Peter Marino. As they enter the boutique, visitors are welcomed by a suspended Lee Bul sculpture, which dominates the dedicated accessory space. 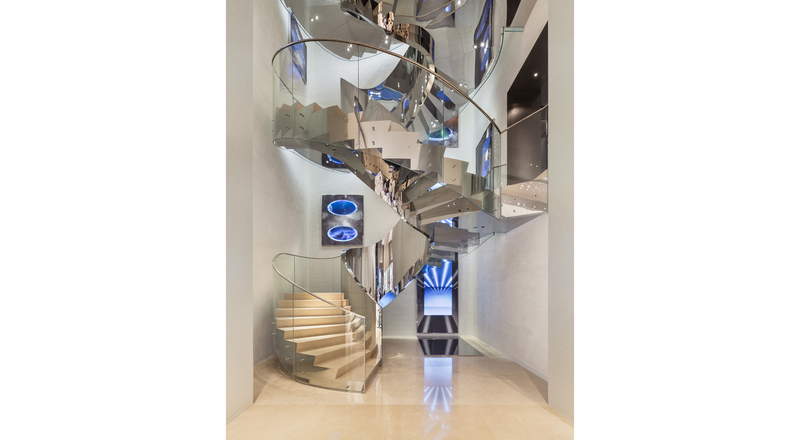 Further on, a staircase unfurling like a ribbon of mirrors leads to the first ever exclusive Dior Homme boutique, as well as to women’s ready-to-wear, watches and jewelry. On the fourth floor, an art gallery and its private salons display a selection of artworks chosen by Dior, while the top floor, opening onto a terrace, is devoted to the Dior Café, with a menu composed by Pierre Hermé. In conjunction with the opening of this exciting new address, the House is also staging the Esprit Dior exhibition at the Dongdaemun Design Plaza until August 25, 2015. Celebrating Dior’s unique creative alchemy, the exhibition draws on the House archives, highlighting the iconic designs that have shaped its history and retracing its long-standing ties with the world of art. At the heart of the exhibition, a series of works specially created for the occasion by contemporary Korean artists offers a fresh vision of Dior. The first French architect to be awarded the prestigious Pritzker Prize in 1994, Christian de Portzamparc also designed the LVMH Tower in New York, and the Chai sur la Colline winery for Château Cheval Blanc in Saint-Emilion.